Everyone loves bragging rights, especially when those bragging rights consist of something truly epic. 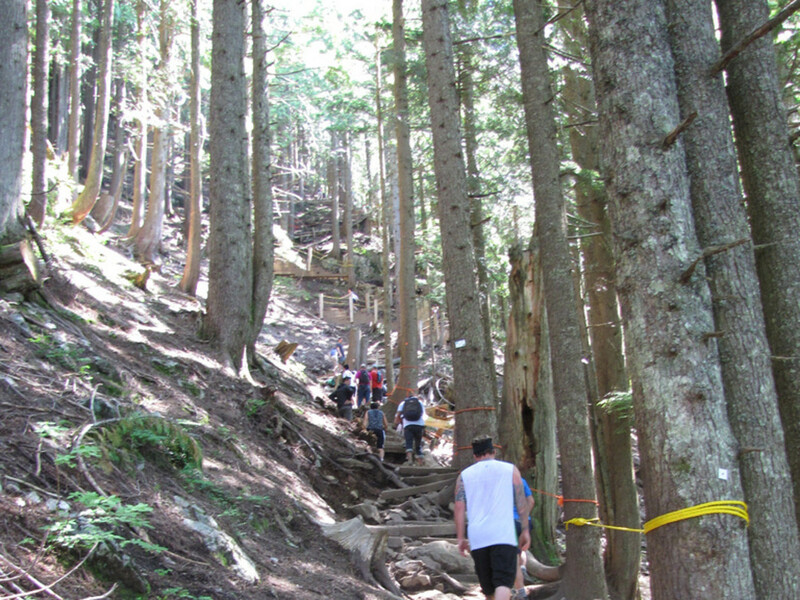 And the Grouse Grind — "Mother Nature's Stairmaster" — is just that. 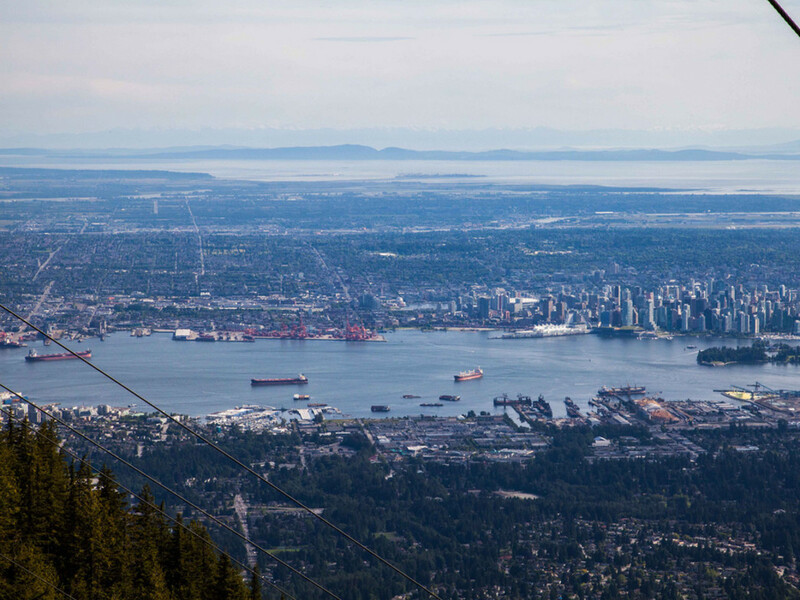 Consisting of roughly 2,800 stairs and surrounded by dense, beautiful trees and fresh air, the Grouse Grind Trail starts at the base of Grouse Mountain, located in North Vancouver, and travels 1.8 miles up its face for a grueling 2,800 feet before reaching the 3,700 foot summit. This hardy adrenaline pumper equates to about 2,830 total stairs. By contrast, the Empire State Building only has 1,860 steps. This famous trail is renowned for two things: first, the obvious — it's a strenuous physical challenge and test of endurance — and second, from the top, you're rewarded with breathtaking views overlooking English Bay and Greater Vancouver as well as Mount Baker to the southeast and Vancouver Island to the west. The Grind is a trail that many Vancouverites use as a training and fitness tool. Chip Wilson, CEO of Lululemon Athletica, maintains a healthy and active lifestyle with a regular exercise routine that consists of hiking the Grind at least three times a week. Also, many professional athletes train on the Grind, and Hollywood celebrities are also known to hike the Grind while filming in Vancouver, including Bradley Cooper, Hugh Jackman, Ryan Reynolds, Russell Crowe and Matt Damon. Every year the Grind attracts more than 100,000 hikers. If you want to go with fewer crowds, it’s best to go early in the morning on weekends and weekdays. 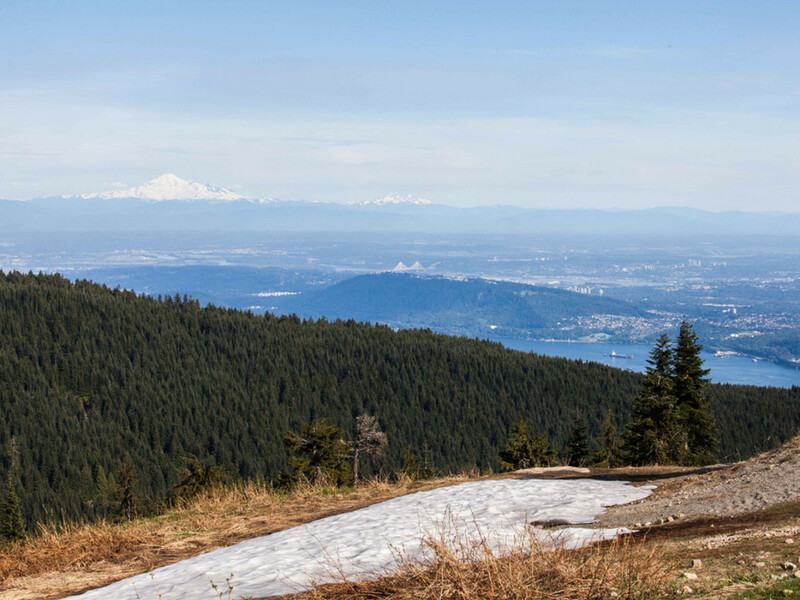 Check the official Grouse Mountain website for hours, as they change with the seasons. As far as parking, there are several lots to park at the base of the mountain, mostly paid parking. You might also find some free parking along the street, but will have to walk a littler further. If you do not have a vehicle, public transportation is available. Tip: There isn’t a washroom on the trail, but one located in the parking lot and at the top of the mountain. Unlike other hikes, the Grind doesn’t give you any breaks. Prepare for many, many stairs. As long as you are in decent shape, you should be able to complete the hike if you go at a comfortable pace. You will want to fuel yourself with nutrient-dense foods so you have enough stamina in your thighs and calves for the second half of the mountain. Pack some easy to digest fuel, such as limited ingredient energy bars, hemp seeds, a banana or raw nuts. Also bring some water and/or electrolyte drink. Depending on your pace, you want to make sure you properly prepare and plan so you can earn your bragging rights when reaching the summit. There are some small areas to the side of the trail where you can catch your breath, fuel up, and drink some water if needed. The trail has a diverse culture ranging everywhere from athletes to families with children to unprepared tourists. Be mindful of trail etiquette and allow those who want to pass to do so easily by moving to the side. The mountainous trail, or better yet, staircase consists of a combination of natural rocks, tree roots and man-made wooden steps. The elevation gain during the entire hike is basically a series of switchbacks straight up the side of Grouse Mountain. For those that are competitive, you can buy a Grind Timer where you are able to track a full year of your performance, get stats and compete in leaderboards. There is even a Grouse Grind App available. And if races spark your interest, look into the Grind Challenge, a mountain run that takes place at the end of hiking season every year. The trailhead starts just east of the Gondola in an area where everyone typically gets organized and stretches before taking on the trek. There is a sign welcoming you as you set foot past the gate onto the trail. As you head over a bridge, you immediately begin your uphill ascent. The Grouse Grind has signs that indicate when you have passed every quarter, however they indicate the altitude rather than the distance. The steepest quarter is the third because the trail traverses over rock, and the fourth quarter includes areas with extremely large steps up until you reach the summit. When you finish, you will feel like a badass as you walk towards the Grouse Mountain Chalet and up the stairs to the entrance, where Gondola riders will be looking at you like you're a celebrity. Start celebrating! The Grouse Grind is a one-way only trail so you will need to purchase your ticket for the Gondola ride before you head back down. Current pricing is found on the Grouse Mountain office website. Spend some time at the top, enjoy the views on the deck, walk around and check out the events or have a bite to eat and beverage at the bar. There is also a nice outdoor retail store where you can purchase a Grouse Grind t-shirt. When you get to the bottom of the mountain, there is even a Starbucks welcoming you. The Grind is seasonal due to snow and ice in the winter months. Metro Vancouver makes decisions regarding this, so be sure to check the official Grouse Mountain website. Even if the trail closes in the off-season, activities do not end there. 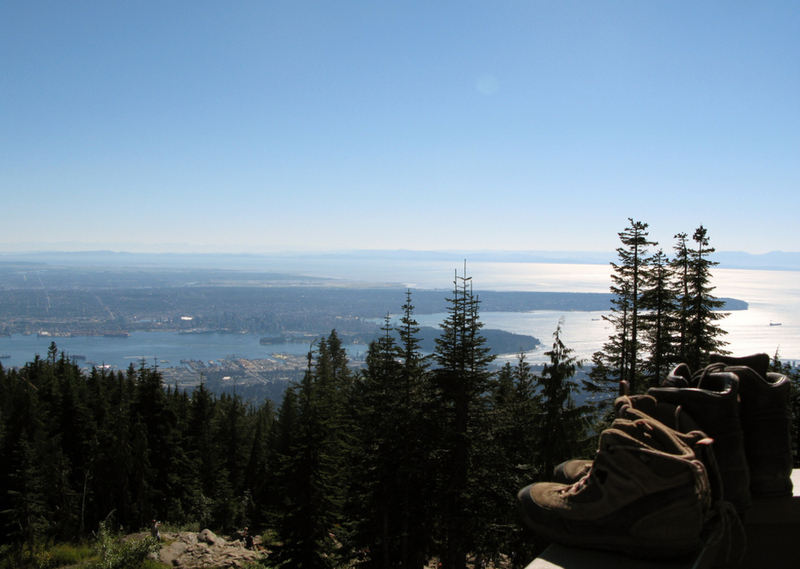 You can also enjoy the Snowshoe Grind at the top of Grouse Mountain, which is a fun way to keep up your endurance. 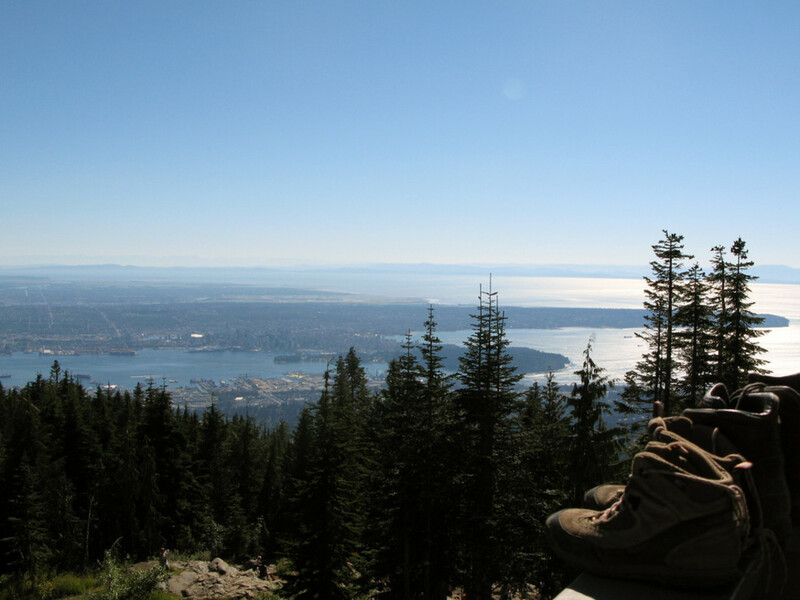 This trail provides a comparable route that will piggyback your Grouse Grind times. If you are visiting, Vancouver is full of amazing things to do and see. Make sure to set aside some time to explore. Check out some of the great downtown areas, as they all offer something a little different. A few include: Yaletown, Robson Street, Granville Street, Granville Island, and Kitsilano. You may also want to plan to see a sunset as there are an abundance of incredible locations, including English Bay – Stanley Park Seawall, Kitsilano Beach, Vanier Park, Cambie Bridge. If you love the outdoors, check out Stanley Park and the Seawall. Stanley Park is the third largest urban park in North America, and the Seawall is a car free, multi-use pedestrian path that hugs the park's shoreline for 5.4 miles. You'll see hundreds of friendly and active Canadians running, walking, and rollerblading around the outer loop that overlooks the water, and you may even be able to join a beach volleyball game if you so choose.